Bates College students spent the last week of April encouraging Native American schoolchildren in Maine to picture themselves attending college in the state. The Bates students visited schoolchildren of the Maliseet, Micmac, Passamaquoddy and Penobscot tribes — collectively known as Wabanakis. From April 27 to April 30, five students and a professor visited Wabanaki pupils in grades four through eight in Presque Isle, Houlton, Indian Township, Pleasant Point and Indian Island. At most of the stops, the Bates group offered a presentation including a slide show, anecdotes and a trivia game. “The goal was to allow the students a time to imagine themselves in college and choose what they might be interested in,” explains Danielle Scherer, a Bates sophomore from Chestnut Ridge, N.Y. The tour of schools and Indian cultural centers was part of the Wabanaki-Bates-Bowdoin-Colby Collaborative, a partnership among the colleges and Maine’s Native American tribes to encourage Wabanakis to take advantage of higher education in the state. Nationally, Native American students are disproportionately enrolled in two-year colleges, as opposed to four-year programs, and are much less likely to finish college than their non-Native American peers, according to a 2007 U.S. Senate report. At Bates, out of nearly 1,800 students, only six Native Americans — and none from Maine — were enrolled in fall 2008. Enrollment at Colby and Bowdoin was similarly low. But Bates “is committed to recruiting and retaining Maine students,” explains Marylyn Scott, a Bates dean involved in the WBBC Collaborative. “This is a population of Maine students that we have not previously tapped into, and it’s incumbent upon us to do so. For Bates, the WBBC program is one of several initiatives that are increasing the numbers of, and improving the campus climate for, students from groups historically underrepresented in academe. The Bates students on the WBBC trip were struck by the extraordinarily close familial and personal relationships among the Wabanaki, explains Hannah Richardson, a sophomore from Concord, Mass. Though many Americans expect at age 18 to leave home and start redefining their bonds to home and family, that’s less the case with the Native Americans in Maine — a cultural trait that could pose obstacles to success in the traditional college track. The experience of reaching across cultural boundaries was particularly important for two of the Bates students, who are taking the course “Contemporary Psychotherapies,” taught by Professor of Psychology Kathryn Low. The trip had no therapeutic aspect, but “part of the course focuses on connecting to those of different cultures, races and ethnicities,” says Low, who accompanied the Bates group. In another piece of the WBBC Collaborative program at Bates, Native American high school students visit campus during the summer to get a sense of how the admissions process works and what classes are like. That initiative inspired a member of the Maliseet tribe, Isaac St. John of Houlton, to start at Bates this fall with the class of 2013. The WBBC trip took place during Bates’ five-week spring Short Term, which gives students the opportunity to concentrate on a single topic. Coincidentally, a second group of students will take a similar journey during this Short Term. 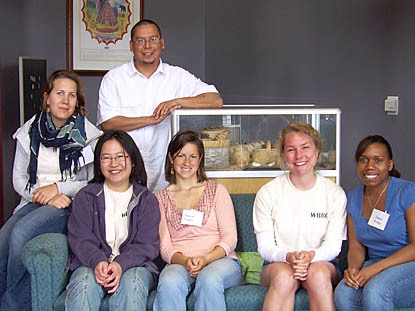 They are members of a course on Wabanaki history taught by Associate Professor of History Joseph Hall Jr. The course includes visits to the Penobscot and Passamaquoddy communities, where the Bates visitors will interview residents on a variety of issues.